Prunus mahaleb, the St. Lucie Cherry or Mahaleb Cherry, is a small Eurasian ornamental tree of the rose family, growing to 30 feet tall. 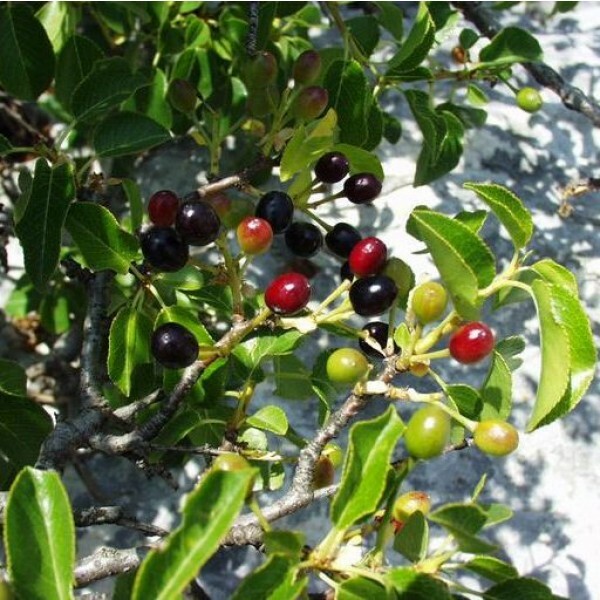 Mahaleb cherry grows abundantly in West Asia; it is, however, sometimes found in Eastern and even Central Europe, where it prefers warm and dry climate. They make nice bonsai. Mature plants bear masses of fragrant cup-shaped white flowers. It is in flower from April to May. Each inflorescence typically has fewer than 10 flowers in a raceme. The flowers are hermaphrodite, they have both male and female organs. Mahaleb Cherry trees, being rather robust and insensitive to diseases. It is a Cherry with interesting foliage, it has bright green heart-shaped leaves, simple and toothed, which turn yellow in Autumn. The leaves are very small in this species 2.5-5 cm long and nearly as wide as long. The stems do not have thorns. Hardiness zones 5-8, (-26°C/-15°F, -10°C/15°F) in Winter. Thrives in a well-drained moisture-retentive loamy soil, growing best in a poor soil. It is very drought resistant, but cannot tolerate poor drainage. Succeeds in sun or partial shade though it fruits better in a sunny position.